The US Federal Reserve is due to meet this week to discuss monetary policy. Most people expect the Fed governors to make a statement that basically repeats their most recent comments that they aren’t planning to raise interest rates. They might also cut their forecasts for US GDP growth for this year – probably citing weaker global growth and the impact of the government shutdown on growth in the first quarter. Why does this week’s Fed meeting matter? There are a few reasons, but the biggest is that the Fed’s decision in January to change its stance and keep rates on hold has probably been the biggest driver of the rally we’ve seen in equities this year. Broadly speaking, they are probably going to repeat what they said at the last meeting. There might be some additional details, but that seems to be the majority expectation. But even that can be interesting – for two reasons. First, everyone will look for signs of how the Fed view has changed. Are they more worried about the economy than we thought? Or they actually a bit more optimistic? 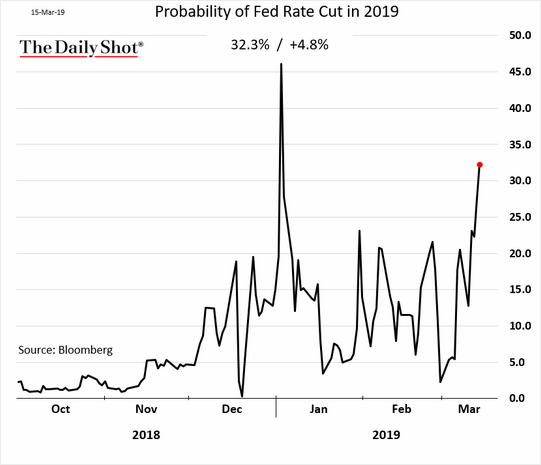 The chart below shows the market-implied probability of a rate cut in 2019. It’s still relatively low, but it has been rising since the end of March to 32.3%. 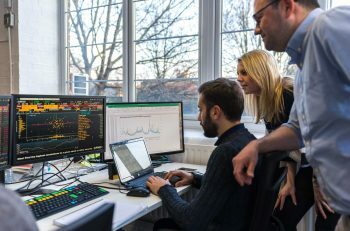 The number of Wall Street economists expecting a rate cut this year is rising, albeit at a lower pace. What’s more interesting is that they still see a better than 50% chance of a rate hike this year. We don’t think that’s expected by financial markets. Why could we see a rate hike this year? Wall Street economists are nothing if not fallible. But the chart below outlines the argument well. Basically, the Fed has historically hiked interest rates as wage growth has accelerated. 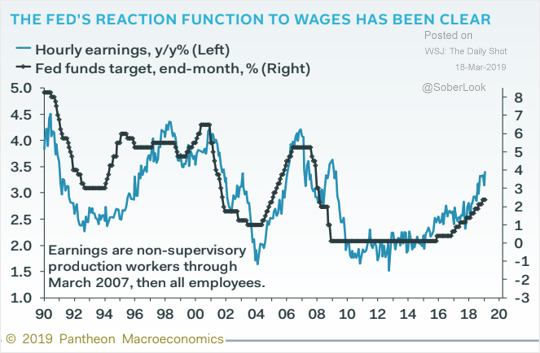 And we’re still seeing wage growth in the US picking up – even in the last report, when job growth was a little disappointing. Now we’re still some way below the peak wage growth of 2007, but so are US interest rates. What about the second point? The second point is whether everything is in the price. It is, as we’ve said before, unknowable. No one can really know for certain what is priced into financial markets. If equity markets have already reacted to financial news (in this case, that the Fed stops raising rates), will simply repeating that statement cause a reaction? In theory it shouldn’t. And that’s another reason why analysts will be looking for new information from the Fed statement. Financial markets aren’t expecting the Fed to hike rates this year. And that’s probably the most likely scenario. But there are reasons to think that view could change. Would that be a major problem for equities? We don’t think so, provided growth remains decent. 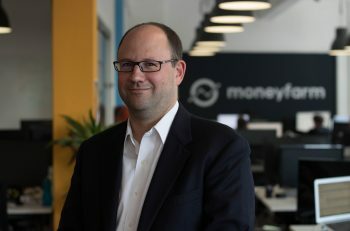 But if the rally was started by a more cautious Fed, you’d guess that signs of possibly higher rates could see some profit-taking from investors. And we think it’s something that’s worth monitoring. Next article What is the annual 2019/20 ISA allowance?